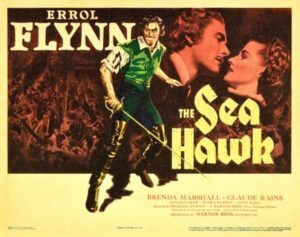 Shortly after the success of Captain Blood (1935), Warner Bros. optioned Blood author Rafael Sabatini’s The Sea Hawk as a follow-up vehicle for Errol Flynn; but production was postponed, partly because the plot of Hawk was too similar to that of Blood. Several years passed, war between Britain and Germany began to appear inevitable, and the British production of Fire Over England provided a model for an American approach to the same historical events. The Sea Hawk project was revived, retaining the title but with a new story by Howard Koch and Seton Miller (who a year later would write Casablanca), a tale set during the run-up to the Spanish Armada that sent Flynn back to Elizabethan England for the second time in two years. Besides providing the model for the story, Fire Over England also gave the movie its queen in the form of Flora Robson, reprising her memorable rôle of Elizabeth I. The film starts with the English queen’s opponent, Spain’s King Philip II, sending his suave ambassador (Claude Rains!) to England to string Elizabeth along while Spain builds her Armada for an invasion. Only England stands between a ruthless tyrant and his conquest of the world. (Sound familiar? The movie was released just before the commencement of the London Blitz.) However, on approaching England the ambassador’s galley, rowed by English slaves, is attacked by an English privateer captained by Geoffrey Thorpe (Flynn). Superior English gunnery, followed by a fierce boarding action (“It’s cutlasses now, men!”), carries the day; the slaves are freed, and Don Alvarez and his niece (the tepid Brenda Marshall) are taken. Thorpe wryly promises to deliver them to the queen—along with the loot from their sinking galley. It’s just about the best first twenty minutes of any swashbuckler. Meanwhile, England’s royal court teems with the schemes and intrigues of the queen’s ambitious advisors. Here comes the excellent Henry Daniell again, once more treacherously plotting—why wasn’t he run out of London after Elizabeth and Essex? But the queen is his match; when Daniell and Rains complain about the privateers, Elizabeth publicly reproaches the Sea Hawks, especially Thorpe—and then congratulates him in private. She even allows Thorpe to persuade her to give him tacit permission to attack the annual Spanish treasure convoy in Panama. But there is treachery and Thorpe is betrayed, though the ambassador’s niece, who’s fallen in love with him, tries too late to warn him. In Panama Thorpe and his crew are captured, and the Inquisition sentences them to life as galley slaves. Then things get serious. With the great Michael Curtiz directing, Orry-Kelly on costumes, and a soundtrack, possibly his most magnificent, by Erich Wolfgang Korngold, Warners had their A-team on this picture, and it shows. Flora Robson is tremendous as Elizabeth, the escape of the galley slaves is taut and suspenseful, and Flynn gets to do some of his finest swashbuckling in the exciting finale. Watch for Fritz Leiber, Sr., in a brief rôle as the vulturine Inquisition judge; fine supporting work from Gilbert Roland as Captain Lopez, the only honorable Spaniard; and a mischievous pet monkey that will feel familiar to fans of the Pirates of the Caribbean series.